Experiencing the Old West in the Southern Hemisphere. Herding cows on the El Charabón estancia in the Rocha province of Uruguay. As a sudden rainstorm swept over us, I hunkered thankfully into the wool poncho that ranch owner Jorge Zuasnabar had lent me for today’s early morning cattle work. 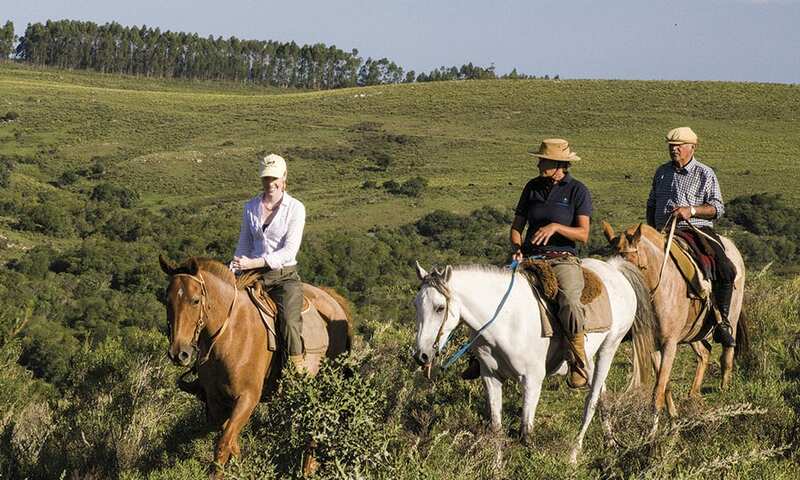 I had come to his working estancia (ranch), El Charabón, to learn firsthand about gaucho life in Uruguay, and to discover if the legendary gauchos of my imagination still existed. 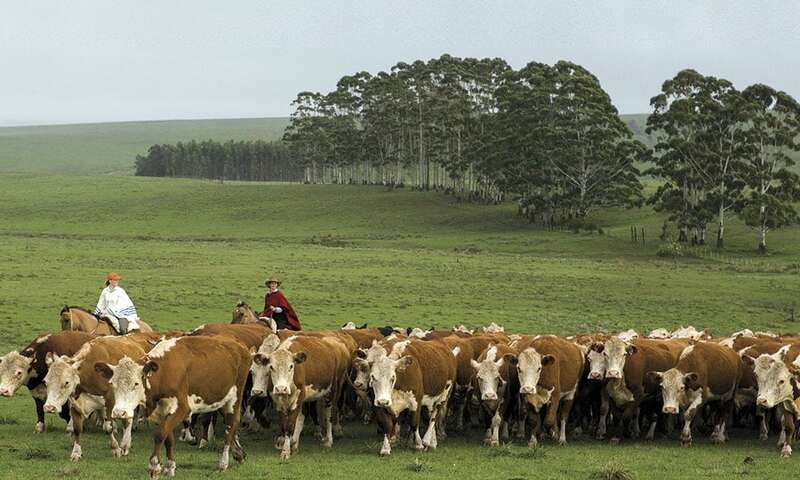 Uruguay’s economy is largely based on cattle production, making the daily tasks of the gaucho essential. As I moved the herd with the gauchos, I felt like I was stepping back to a simpler, more natural time. When Fernando, one of El Charabón’s gauchos, trotted and then loped towards a breakaway cow, I knew that I was seeing the real deal. Uruguay, a small South American country bordered by Brazil and Argentina, has an ideal climate for cattle ranching and beef production, and along with that, a celebrated horse culture. Along the three-hour coastal drive from the capital city of Montevideo to El Charabón, horses populate the fields and graze by nearly every yard. Men ride horseback alongside the roads, work cattle with horses, and even children drive horse-drawn carts. In Uruguay, ATVs and trucks haven’t replaced steeds; the gauchos on the estancias still use horses to get things done. The gauchos and their mounts work long days outside, with the sense of pride and freedom—as with their American counterparts—that goes along with this type of work. Like our North American cowboys, the gauchos devote themselves to working with and protecting the ranch’s livestock, treating sick cattle, moving stock from pasture to pasture, and more. El Charabón, an estancia turística (guest ranch) in the Rocha province, raises cattle and sheep and is run by Jorge and his wife. As a guest at El Charabón, you’ll engage in real work and day-to-day life with true gauchos. Don’t worry: This is a place where you don’t really need to speak the same language to ride with the gauchos and enjoy their way of life. Hand and arm gestures work, along with a simple nod or a smile. Uraguayan gauchos wear bombachas—lightweight cotton pants with wide legs that cinch at the ankle—tucked inside soft, knee-high leather boots. Headgear may be berets or wide-brimmed hats. They ride in sheepskin saddles, carry a facón (dagger), a rebenque (leather whip), and a poncho for inclement weather. 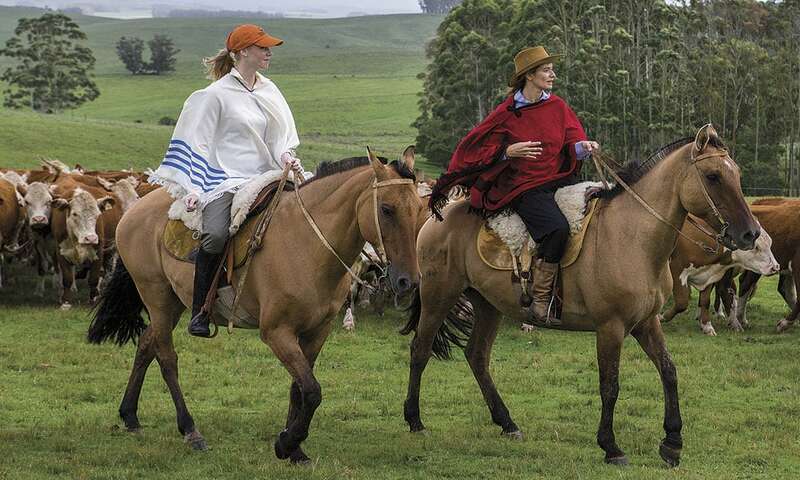 Wishing to experience authentic gaucho style, I rode in a pair of bombachas. They’re very comfortable attire; in fact, I would have worn my bombachas on the plane, had they not been wet and dirty from my time riding in them. The stirrups on the sheepskin saddles—some round and some triangular—challenged me, however, as my feet slid around in both kinds. This made things interesting when we came to some abrupt stops while rounding up the herd! Gauchos—as well as people all over Uruguay—drink yerba mate, a tea made from the naturally caffeinated leaves of the South American holly tree. It’s strong. The first morning I tried it and liked it, but it’s definitely a morning drink for me. I was offered it in the afternoon and declined because I knew I would be up all night if I drank that much caffeine. The gauchos, however, sip mate through straws all day long, another source of their energy. I asked Jorge how one becomes a gaucho, and he told me that most gauchos are born into the tradition, with skills passed down from father to son, similar to modern-day American cowboys who grow up riding in rodeos and doing ranch work. My lack of Spanish language skills prevented me from peppering Fernando with questions, which he probably appreciated as he, like many of the gauchos that I met in Uruguay, seemed a bit shy. His shyness and that of the other gauchos led me to cast them as strong, silent types, not unlike our iconic American cowboys of the silver screen. Touring the rolling hills of La Salamora. Traditionally, a South American gaucho lived a nomadic and solitary life, living off of the land and sleeping under the stars as he traveled to various ranches where he might be needed. Although some gauchos still do this, most gauchos in Uruguay today are employed by single ranches, and this has changed their lives. At La Salamora, an estancia that I visited in the rocky, rolling grasslands of Lavalleja, I met Gilberto, a nomadic gaucho until being hired by the ranch a few years ago. 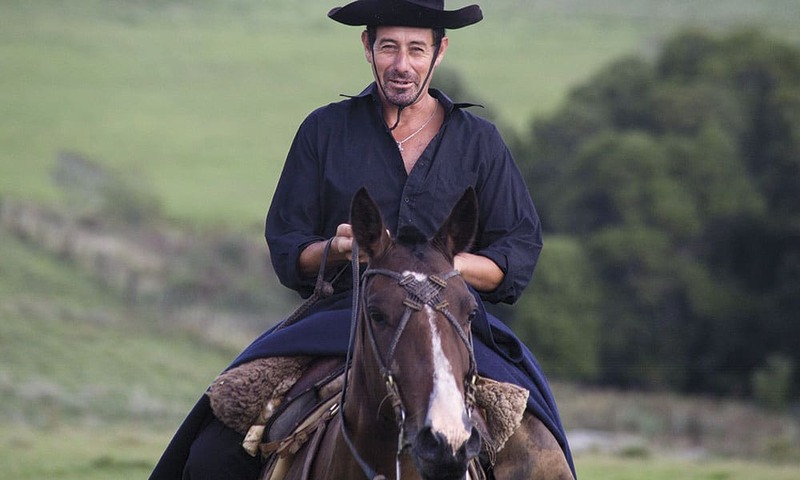 Prior to coming to La Salamora, Gilberto lived outside, using his saddle as a pillow, and worked for various area ranches when they needed him. Gilberto now lives in a house on the ranch with its own television, something that brings him news of places that before he didn’t know existed. Things are changing in Uruguay for the gauchos and have been for many years, but real gauchos are still doing real work (they just do it a bit more comfortably now). As I traveled around Uruguay meeting other gauchos on other estancias, I was glad to be able to experience these pure, working ranches with real cowboys and appreciative that many of the ranchers I met want to hold onto this and to their heritage, even as they advance into the future. As I learned to ride gaucho-style, I realized that I was seeing something special in Uruguay, something best viewed from a horse’s back: countless estancias where able gauchos ride herd, as did their fathers before them, in the timeless dance of rider, horse, and cow. If You Go: El Charabón Estancia Turística, Rocha/Uruguay, elcharabon.com.uy.